NotiPi: Sending SMS Messages, Tweets, Etc. Packaged versions of some of the other projects (and snapshot development versions of SimBaMon) are available from https://launchpad.net/~hamish-dcs/+archive/pi-gate (an Ubuntu PPA1 set up to be suitable for Raspbian). See the next section for installation instructions. This will create a directory pi-tronics on your local system. See the file README.txt in that directory for details of what is where. You can also browse the code on-line — here's the flood alarm script, for example. See our page on Pi software packaging for more details. Eben Upton and Gareth Halfacree's book The Raspberry Pi User Guide is definitely the first place to start. Required reading. Gray Girling's Haynes manual is my all-time favourite so far, perhaps because I remember my brother using these manuals to figure out how to fix his Triumph Herald way back when. It also has great graphics and an excellent mix of hardware and software, plus some philosophy and history to boot. I love it. Slightly off the beaten track, but a great fit for the Pi's mischievous implications, I recommend Stefan Sjogelid's Raspberry Pi for Secret Agents. If the NSA and GCHQ are going to spy on every citizen for no good reason shouldn't we spy on them in return?! If it's your birthday, ask for a book token — there's more to drool over in the next section. The Pi foundation's site is the place to start: lots of good reference material, and there's always something new to read on the blog. For discussion and advice, the community forums are excellent. Cambridge Univerity Computer Lab is where the original idea for the Pi came from, and they host a great set of Pi materials including these tutorials. The MagPi monthly eZine is well worth a look, as is the Pi Weekly email news digest. The WiringPi library site is also well worth a visit. There are oodles and oodles of Pi hobby sites — really too many to make a list these days! Simon Monk's 2013 book Hacking Electronics, which achieves a nice balance between explaining relevant theory and quickly getting on with practical stuff right from the start. Although some of the chapters are specific to the Arduino3 there's a lot of generally useful stuff too, including introductions to breadboarding, stripboard, soldering and the like. A good book if you're in a hurry. The 2009 Make Electronics by Charles Platt, which also has loads of great introductory material, and is a typically high quality O'Reilly production with Make Magazine's usual emphasis on colourful graphics and detailed instructions for the hobbyist. This book is very detailed and has lots of intriguing background4. The Embedded Linux wiki has great globs of Pi-related stuff, including a bunch of very useful tutorials. 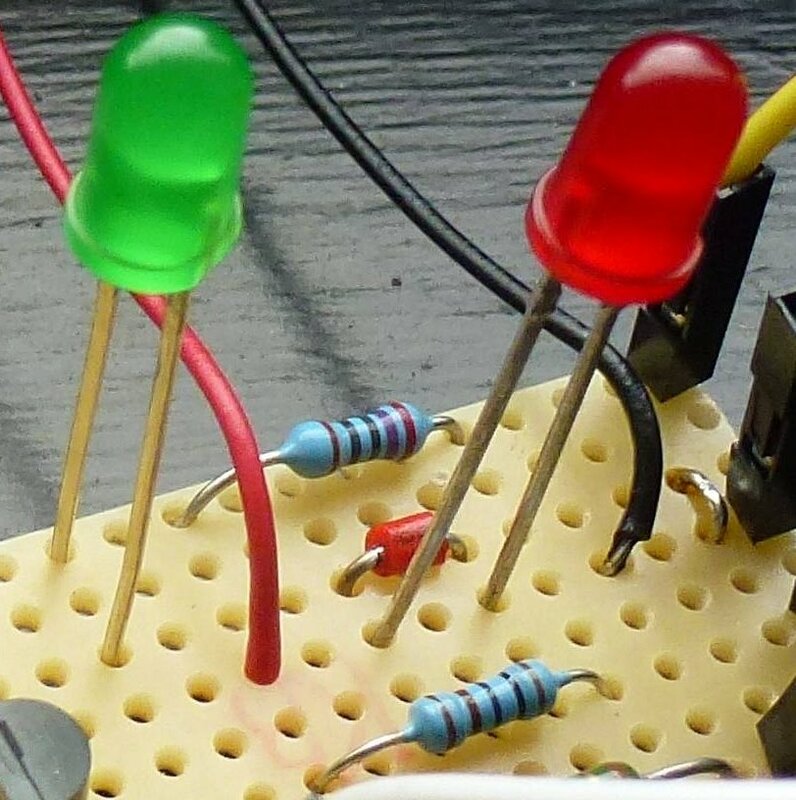 AdaFruit's tutorial pages include an excellent guide to soldering (and one for measuring). Another useful beginners' site is Electronics Club. The circuit diagrams are available on Circuit Lab under the Creative Commons BY-NC-SA licence. For circuit debugging these Voltage/Resistance/Current calculators are useful: this one, this one, and this one all worked well for me at one time or another. PPA: Personal Package Archive. Usually used for Ubuntu software packages but also useful for certain types of packages for the Raspberry Pi. In July 2013 Google lists more than 12 million hits for the phrase "raspberry pi"! The Arduino is an extremely capable device that is both fore-runner and partner to the Pi. Based on a micro-controller chip, Arduino has been a major driver of the wave of low cost, flexible and open hardware on whose crest the Pi is now riding. It has a larger set of interaction functions (higher power and better safeguarded than on the Pi), but is a bit less powerful and general-purpose from a computational point-of-view. No doubt both will co-exist, and a good number of projects combining them are already available. I never knew, for example, that in terms of the movement of electrons electricity flows backwards from negative to positive, and that the conventional reverse flow is just that — a convention dating back to a mistaken conjecture by Benjamin Franklin. Well I never! If you really want to get in deep, here are two comprehensive sources: All About Circuits; the MIT Circuits and Electronics starter course in electrical engineering. GATE is free software under the GNU licences and others. All our products and services supplied with no warranty. Raspberry Pi and the Raspberry Pi logo are trademarks of the Raspberry Pi Foundation. Print.